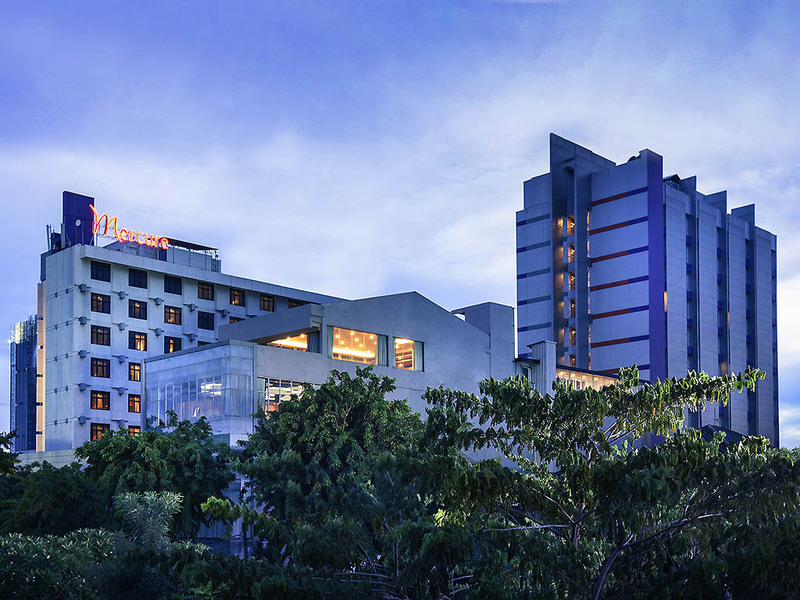 Mercure Surabaya is a mid-scale hotel located on the main route through Surabaya, next to consulate and government offices, business district, and tourist attractions such as the Tugu Pahlawan monument and the Surabaya Zoo. Ideal for business and leisure travel, with easy access to Gubeng railway station and Juanda airport, the hotel features 257 rooms including 19 suites, 3 restaurants, a coffee lounge, pool bar, 12 meeting rooms, a ballroom, swimming pool, gym, bicycle rental and spa. Surabaya is the center of business, commerce, industry and education in Eastern Indonesia. Rich with cultural and historical value, the city also have rapid business life, as well as great leisure experience and mouth watering cullinary choices. Our modern Chinese cuisine restaurant seats 90 and also has 3 private dining rooms. Indonesian and international cuisine in an open kitchen style, close to the lounge area and with views to the swimming pool and pond. Our American style coffee lounge serves sandwiches and cakes all day and has live entertainment starting from 6pm. The Oasis swimming pool is located at back of the hotel building along with a pleasant garden arrangement and pool snack bar. Overall i had good experience stay at mercure, after long time not stay in mercure surabaya because i was change my stay to Novotel Samator, this time i back again to stay at Mercure and i am quite satisfied on my last stay. The problem i found a bit only in breakfast time because during my stay there is a group (quite big group) stay in there also and breakfast time like a chaos because have not enough seat and i cannot enter the breakfast place so i have to wait in the coffee shop but the service of the coffee shop waitress is quite good, they offer me free coffee during waiting to be seated into the breakfast area. And this time so lucky for me because i was get a free upgrade to suite room. And i like the suite room because so spacious and have separate bathtub. Buffet dinner was So so but the room service is quite good (i was order beef stroganoff). All the staff quite good so i have good experience on my last stay.. my problem only in this hotel many times during my stay there was another big group stay in here too (and if like this breakfast time always become a bit chaos) but many times big group stay here too so it means this hotel quite good in their hospitality. I will stay in Mercure again for the next visit for sure! I just stay for 1 night and expect the room to be perfect. Everything was fine until late night when I was about to went to sleep and just realized the double lock didn’t worked. Unfortunately at 1:30 am, the door was knocked not just once but twice, and there was male’s voice muttering outside. Didn’t get out at that time for some random knocking while I put DND sign. Therefore it was a huge turnover since it’s related to safety and security. I told the staff during check out the next morning and all he said was I should’ve told the staff and move to another room even if it’s late night. I was just stay for 1 night and expect the room is ready when I entered. Cleanliness is great this time but unfortunately I was just tried the lock at night. Exhausted, to think about move everything at night or even midnight will be such an unpleasant option since your staff did told me upon check in that you’re fully booked therefore she couldn’t provide 2keys for the room. It’s just a simple room key that you couldn’t provide so how could you expect guess ask to move to another room? What I’m saying is, at first I just want to share about the knocking at midnight as unpleasant experience and just repair the double lock for the next guest. But the way your staff keep on emphasizing “so you didn’t complained right?” more than 3 times was somehow just showed that you don’t want to be blamed and not even care to apologize for any inconvenience experienced nor will check the safety of the door. based on my experience, I shall recommend this hotel to others. Friendly and humble staff. environment of hotel very clean and nice. food is so amazing and delicious. Don't know if my neighbor was loud or the wall of mercure hotel is too thin, because their voices disturbed my sleep. Also the shower in room 702 is broken so the height and the angle can not be adjusted, so it's not convenient. Strategic, near mall and market. the room was clean and the breakfast has many choices, delicious. but the wifi connection seems to be having trouble. Amazing place for my memory. Always a great time for staying at this place.